There is sinus tachycardia (rate = 120) with what appears to be diffuse ST depression in leads II, III, aVF and V2-V6. However, if you look closely, the PR segment is downsloping. This is due to a pronounced negative atrial repolarization wave (atrial T-wave, or "Ta-Wave"). The wave is still negative at the J-point, and thus depresses the J-point. The ST segment is most commonly measured at the J-point and relative to the PR segment, but when there is a Ta-wave, this method is inaccurate. K. Wang (my mentor) recommends measuring the ST segment relative to the end of the PR segment (this is also called the PQ junction, and the recommended location for measurement according to ACC/AHA) However, in my experience, when there is a Ta-wave, the PR interval is still downsloping at this point and this method of measurement will underestimate the effect of the Ta-wave. Also, in my experience, and contrary to research I outline below (and which contradiction I cannot explain), the greatest part of the Ta-wave is back to baseline by 60-80 ms after the J-point. In the case above, if you measure the ST deviation at 60-80 ms after the J-point and relative to the TP segment, you'll see that there is no ST depression. Many textbooks recommend measuring the ST segment at 60-80 ms after the J-point and relative to the TP segment, presumably because it helps to avoid the issue of the Ta-wave. However, especially in tachycardia, the TP segment may never come back to baseline after the T-wave; furthermore, the T-wave has often begun by 80 ms after the J-point, as in this case. The atrial repolarization wave lowers the baseline, but its amplitude, if present at all, is not great (maximum 0.2 mV, or 2 mm at normal recording). It is not finished until up to 180 ms after the J-point (see references below). 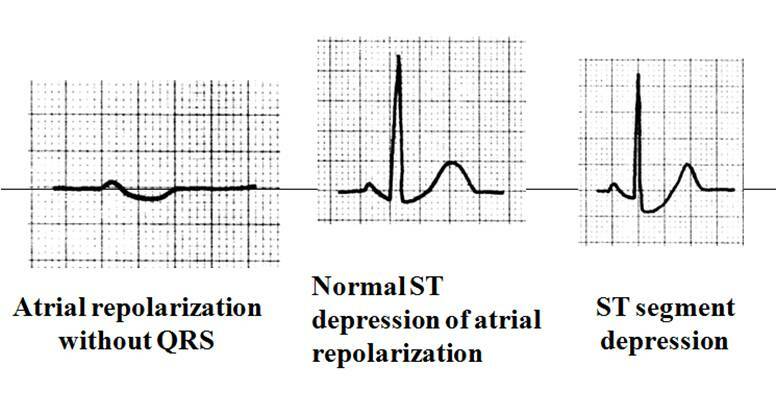 Learning point: Beware diagnosing ST depression before considering the atrial repolarization wave as the etiology. The Ta-wave is a mean of 320 ms after the end of the p-wave, with a duration of 2-3x that of the p-wave and a polarity always opposite of the p-wave. The PTa duration (onset of p-wave to end of Ta-wave) is a mean 440 ms, though it varies with heart rate just like the QT interval. 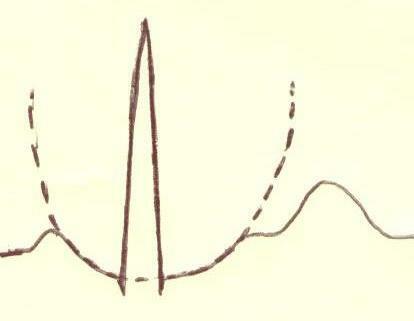 Thus, if the PR interval is 160 ms, the Ta-wave ends about 280 ms later. If there is normal conduction of 100 ms, the Ta-wave may still be present at 180 ms after the end of the QRS! Even if the patient has Bundle Branch Block with a duration of 140 ms, then the Ta-wave may still be present 140 ms after the end of the QRS. 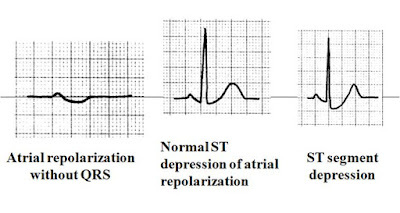 Here is a short explanation of the atrial repolarization wave. Here are two detailed articles measuring the Ta wave: one by Holmquist et al. and another by Debbas et al. Thanks again for the great case Dr. Smith... in leads with a negative P wave, can the atrial repolarization wave cause an "apparent" elevation of the ST segment? Yes, indeed. I have such a case in my book, in which there is a high nodal rhythm, with a negative p-wave before the QRS, and the ST segment is elevated due to the Ta wave. when you say "caffeine overdose," do you mean she had 20 cups of coffee, or is there something else out there the kids are using that we should be aware of? Excedrin with Acetaminophen and Caffeine. whether atrial Ta wave can be seen in normal subject ECG's???? It is a normal finding, but as I'm sure you know from experience, it is not on every normal ECG. So it may or may not be present. Thank you for an excellent review of an important, but rarely discussed, phenomenon. '...it may or may not be visible.' rather than '...it may or may not be present'! Thanks. However: No, I mean may or may not be present. Some atria do not have a repolarization wave, some do. by using the modified chest leads emphasizing more on the atrium i was able to see a wave opposite polarity to P wave and duration longer than the P wave in normal subject..
A tangential question: how does this bear on our interpretation of the PR and ST in pericarditis? Is the PR depression in pericarditis simply a Ta-wave? Should we be measuring the ST segment in pericarditis relative to the PQ junction? If so, would that mean that an ECG that showed PR depression with the ST segment at the same level at the TP segment is actually an "elevated" ST, because we would expect it to have a depressed appearance due to the Ta-wave? Good question. Yes, pericarditis exaggerates the Ta wave. Normally, according to ACC/AHA, we should measure the ST segment relative to the PR segment, and since it may be downsloping with a Ta wave, this is best done at the PQ junction. If you are measuring the ST segment at the J-point, the Ta-wave is still present there, so it should not affect your measurement. If, on the other hand, you are measuring from some time after the J-point, then you might be measuring after the Ta wave is returning to baseline. Therefore, your measurement will be off. So, if you measure ST elevation at the J-point, relative to the end of the PR segment, the Ta-wave should not greatly affect the accuracy. Finally, ST segments are best assessed by the subjective assessment of an experienced electrocardiographer. I have shown in my study of subtle anterior MI vs. early repolarization that all ST elevation criteria are nearly worthless in diagnosing anterior STEMI. Can it depend from adrenenergic hypertone? I remember I saw similar ECG in a very anxious girl and in a case of hyperthyroidism. in which cases atrial repolarization appear in an ECG ? Good question but I don't know the answer.